2019 has brought another “girls only” program to Calleva outdoors! 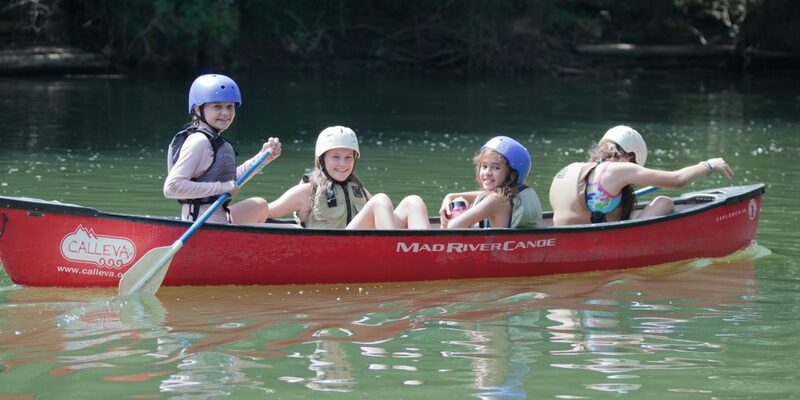 In addition to our girls week of Kayak Potomac High Adventure , we have also partnered with Girls on the Run to bring you Calleva’s Girls on the River . Each day the girls will enjoy a different outdoor activity, which will be coupled with programming designed to help them realize their individual power and be able to reach their highest potential. Even if you can’t sign up for one of these programs this summer, there is still so much you can achieve by just coming to camp. Below are my five wishes for all the girls at camp this summer. Let loose. Unlike school, there are no ‘popular tables’ in the lunchroom. Unlike school, it’s cool to be weird. So unleash your inner weirdo. Sing loudly, dance like a penguin, and laugh so hard you snort. Find a female role model. Outdoor recreation is no longer a male-dominated field. Find one of the many strong, capable female outdoor leaders and get to know her. See her change a tire, carry a raft, catch a fish, and ride up the steepest hill. Get dirty. I mean really stinky. And better yet, don’t care about it. Appreciate your body for what it can do. Our bodies are magnificent machines that are capable of running and paddling and biking and climbing and more! When you come back from an epic Calleva overnight and haven’t seen a mirror in 2 days, you stop caring what you look like and instead focus on the amazing things you’re capable of. Own your accomplishments. Do something truly incredible. Roll your kayak, overcome your fear of heights, write a winning camp song… It’s important to be able to say “I’m capable of amazing things” and mean it.